it seems i do best on assignment - yarn along being a good bet. 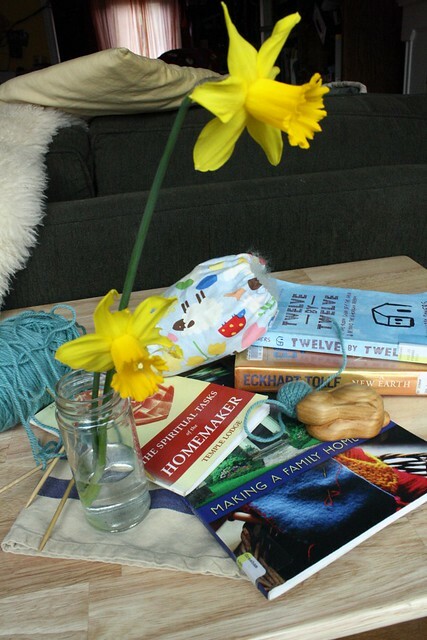 there's always yarn and books around. even when not much progress is being made in either. i just started twelve by twelve last night and love it already. the homemaking books i also wish to pull some quotes from, but time being of the essence... colden is napping some days, some days not. on days he does not, he has a bath instead. miraculously, this is one of those times and azalia is also sleeping. i am still knitting away at that sweater. pictured here are some promised (and overdue) woolly eggs.